This post is a travel guide with the best things to do in Mysore. Mysore is one of the most beautiful cities in South India. I spent several weekends in Mysore and explored not only the best things to do in Mysore, but also the best food and restaurants in town. Indian cities can be crowded and chaotic. Whenever I plan a trip to India I am trying to spend the least time in them. India’s incredible nature and rural life are simply more appealing to me. Other cities that I now love, such as Delhi, took their time to grow on me. Mysore, however, was love at first sight and I felt at ease immediately. The city with its royal heritage and old colonial architecture has a lot of character that is hard not to like. Add in great food and a lively bazaar and you have plenty of reasons to go to Mysore. When I started to write about Mysore I realized that there aren’t even that much things to do in Mysore itself. 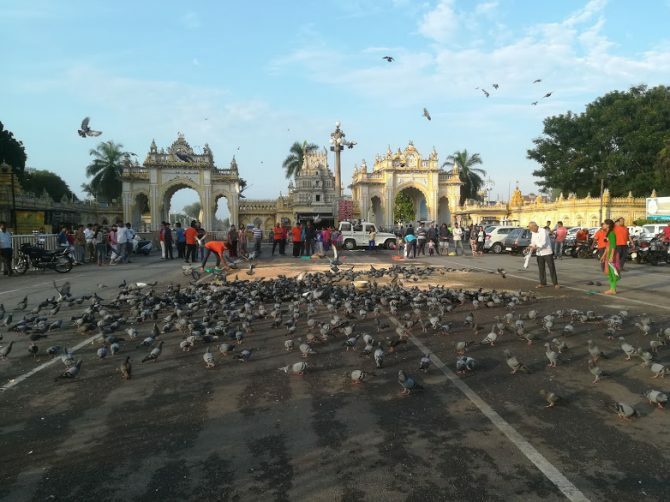 It is the relaxed atmosphere, the friendly people, the delicious food and some great opportunities for exciting day trips that made sightseeing in Mysore a rewarding experience. Mysore has a rich history and was the capital of the Kingdom of the Wodeyars for almost six centuries till 1956. It’s still a city of palaces, heritage homes and mansions and is also referred to as the cultural capital of Karnataka. The best thing to do in Mysore is a visit to the Mysore palace. It was once the seat of power and residence of Mysore’s royal family. Now it is open to the public and the interior is just as colourful and beautiful as what you see outside. Each room has new surprises such as detailed wood carved doors and fine paintings. Look closely and you see that outside the palace is decorated with light bulbs. In fact, there are more than 96,000 of them. Every sunday evening at 7 pm the palace is illuminated. My first day in Mysore started and ended with the palace in all its glory. Visitor tips: The palace can get crowded, especially in weekends. Try to be there early when the palace opens at 10 AM. Entrance fee is 50 rupees. The Mysore palace is not the only palace in Mysore. It is not even the oldest, because it was destroyed in a fire and the current building is from 1912. The oldest palace is the Jagan Mohan palace that now houses an Art Gallery. Most people only include the Mysore palace in their Mysore sightseeing itinerary, but the other palaces are also worth a visit. Mysore is all about palaces and the best thing to do in Mysore to feel like a king is to eat at the Lalith Mahal Palace Hotel. In this former royal palace you can treat yourself on a lunch buffet in one of the most spectacular settings. Honestly, it will be a bit above the average backpackers budget and you pay for the location, not the quality of the food. An extremely popular thing to do in Mysore among the locals is to climb the stairs of the Chamundeshwari temple. There is no other place as important for Mysureans as Chamundi hill. Some have included the walk in their weekly exercise regime, others come to seek their blessings at the temple. It was Chamundeshwari, the fierce form of the goddess Durga, that killed a demon that was once ruling Mysore. Pilgrims come in their best and most colourful clothes to get a glimpse of the goddess. It was too crowded for my liking and I had a good time outside where several rituals were going on at a special area for breaking coconuts that will be offered. Even though I skipped my chance to be blessed by the goddess, an Indian lady at my hostel told me that Chamundi will appreciate my visit anyways. All you need to do is take off your shoes and stand near the temple and she will recharge your battery. Visitor tips: If you don’t want to climb the stairs you can take a tuk tuk or bus. From Mysore Palace bus 201 or 201V goes to Chamundi Hill (this bus also stops at Mysore Zoo). The temple is free of charge, but if you want to skip the long que you can pay for the more quiet VIP entrance. Also, watch out for the monkeys that are looking for any opportunity to grab your food. Devaraja market is the heart of the city and is one of the best things to do in Mysore to feel its unique atmosphere. This vibrant bazaar is full of life and Indian chaos. Another reason to add Devaraja market to your Mysore sightseeing itinerary is that you can buy some of the best Souvenirs such as sandalwood soap, incense and silk sarees. One of my favourite things to do in Mysore was simply walking around. When you are away from the centre and tourist attractions you will find peaceful and quiet colourful alleys. Sometimes it feels more like a village then a city. Cows are relaxing in the sun, men are drinking tea in front of their homes and women are hanging up the laundry. The rail museum is the best thing to do in Mysore for train lovers. If you are near the station, you can pay a visit to the open air museum with a small exhibition of vintage locomotives. Mysore is now the yoga capital of the world with some excellent yoga teachers that offer a range of professional courses. Most require a one month commitment, but there are some walk in options as well. The best place to visit in Mysore for yoga is Gokulam. A nice neighbourhood with some of the best yoga schools, vegetarian restaurants and yoga friendly accomodation options. Do your homework, because among the yoga professional are some that try to profit from its popularity. The random tuk tuk driver that claims he is an ayurvedic doctor and yoga teacher, all in one, might not be the best choice. Mysore is known for its sandalwood and when you walk through town you will often smell its unique scent in the streets. The government sandalwood factory runs tours to show you the process of how to make soaps and incense. It will be a fun visit full of fragrances. Mysore is also famous for its silk sarees. They are very beautiful, but not a cheap souvenir. A good quality saree can be 4000 or 5000 rupees. There is a government silk factory at Manadawadi road where you can see how they are made. Mysore is just the start of everything there is to do in the area. The south of Karnataka is full of hill stations, nature reserves and some of the oldest and finest temples from the ancient Hoysala kingdom. I can really recommend you add some of the exciting daytrips to your Mysore sightseeing itinerary. The small town of Srirangapatna is of huge historical and religious importance for Mysore. Its fort was built to protect Mysore, but Srirangapatna managed to become the capital of the Mysore kingdom itself for a short period of time. Nowadays its a pilgrimage town for Hindus that come for the holy Ranganathaswamy temple. This temple might be the most important one, but Sri rangapatna is full with old temples and it is worth to explore further. It’s scenic location on an island in the Kaveri river makes this a great place to wander around and there are some interesting things to do in Srirangapatna. Besides temples you can visit the old mosque, the summer palace of Tipu Sultan and Tipu Sultans mausoleum. How to get there: From Mysore city bus stand bus 313A leaves frequently to Srirangapatna. Srirangapatna also has a train station and most trains between Mysore and Bangalore stop in Srirangapatna. Ranganathittu bird sanctuary in the Kaveri river is among the top things to do near Mysore, especially if you love nature. It is one of the largest bird sanctuaries in Karnataka with more than 170 bird species. If you come early in the morning you will see and hear hundreds of storks, pelicans, egrets and herons. Ranganathittu bird sanctuary organizes boat trips on the Kaveri river to take a closer look. The shared trips are rather short, but you will spot plenty of birds and crocodiles. If you are lucky you can maybe even see otters or bats. How to get there: Ranganathittu is an easy daytrip from Mysore and because it is close to Srirangapatna you can combine both. Bus 307 departs from Laxmi talkies near the Mysore palace city bus stand to the entrance of the park. It is a short walk through scenic rice paddies to the actual sanctuary. Somnathpura is a small village 35 kilometers from Mysore and home to the ancient Chennakeshava temple built by a Hoysala king in 1268. You might have seen plenty of temples already in India, but this one will not fail to impress you. The incredibly detailed carvings have thousands of stories to tell. Mysore is a great city for foodlovers and trying different dishes is one of the best things to do in Mysore. South Indian cuisine is delicious and some recipies are unique to the area of Mysore. Dosa’s are rice pancakes that have a history of more than 2000 years in South India. Mysore is believed to have some of the best dosa’s in the country. Any Mysore sightseeing is incomplete without trying at least one Mysore Masala dosa. Luckily they are never far away. Crusty on the outside and fluffy on the inside. I must admit that Mysore was indeed doing a pretty good job. A plain dosa comes with 2 chutney dips. One red tomato based curry and one white coconut based chutney. The masala dosa comes with the same, but has a tasty potato filling inside as well. A paper dosa is a very long and thin crusty variant of the dosa. More difficult to find, but very healthy and nutritious is the Ragi Dosa made out of local finger millet. It’s on the breakfast menu of Mansion 1907 and worth trying. If you want to try something very local you can try ragi mudde or ragi ball. It is made of finger millet and many people in this region eat ragi instead of rice or chapati. It will not be on the average tourist menu, but if you visit a local restaurant serving Indian thali’s it might be available. I of course ate it in the completely wrong way. I took out little pieces from the ragi ball and mixed it throughout my rice. However, you are supposed to take a part of the ragi ball, dip it in your curry and swallow it. The best and cheapest way to eat in an Indian restaurant is to order a thali. It is a set menu of rice that comes with different types of curries. The South Indian variant is originally served on a banana leaf and you are supposed to eat with your hand. Curries differ per season, but sambhar (lentil based vegetable stew) and/or rasam (a tamarind based soup) are always included. Mysore’s famous sweet made out of gram flour, sugar and ghee butter is a must try. At Guru’s sweet mart in Devaraja market you can try them when they are still hot, straight off the stove. Check this video to learn more about its history and how it is made. I was lucky. It was mango season when I was in Mysore and there was even a Mango fair with over 40 different varieties. The season starts from the end of April till July and the mango’s are juicy and fresh at this time. Mango season is also the jackfruit season. You will smell the jackfruit before you even see the men selling it on carts in the street. I was personally not a fan of them, but locals love them. The neighbourhood of Gokulam is the centre of yoga in Mysore. It is also full of organic and vegan cafes and restaurants with creative and original menus that makes you want to try everything. The fruit smoothies, fresh salads, sandwiches and soups are a welcome change from the regular Indian food. Some recommended restaurants are Rasa Dhatu and Depth N Green. Will the real Mylari please stand up? Mylari has a long history of serving the best dosa’s in Mysore. The Mylari dosa comes with butter and a delicious filling of onions and potatoes. The place became so famous that multiple other restaurants opened up with a similar name. I am almost sure I visited the right one. Anima Mhadvan Bhavan is the place to go for a South Indian thali. Still served on the traditional banana leaf with a variety of curries and chutneys it is among the top things to do in Mysore. Di lemon restaurants serves great North Indian food and has some of the best meat options in Mysore. I can recommend the chicken butter masala with fresh naan bread. The best Italian food in Mysore is at the Old House with wood fired oven pizza’s that have a thin crust and an original menu of different toppings. Mansion 1907 became my home in Mysore. Most of all because of its great location in walking distance from the bus station, Mysore palace and Devaraja market. This hostel has friendly owners, a great breakfast menu and female only dorms. During the tourist season they have free yoga classes in the morning and you can rent bicycles to explore Mysore and its surroundings. There are other hostels in Mysore as well such as Zostel and Sonder hostel. The best time to visit Mysore is from September till March when the climate is pleasant. In april and may it starts to get very hot in Mysore and in June it is the start of the monsoon season when rain becomes more frequent. In October India celebrates the Dassara festival. Dassara has big celebrations in Mysore. Dassara is all about the victory of good over evil. It is one of the most extravagant celebrations, especially in Mysore, where people believe Chamundeshwari killed the demon Mahishasuran. The palace is illuminated daily and the goddess is taken in a procession on an elephant through the city accompanied with dance groups and music bands. Visiting Mysore during Dassara will be a memorable experience. Uber is a good way to get around in Mysore, but India has its own similar business called Ola cabs that is even more popular. The good thing about both Ola and Uber is that it is cheaper than a tuk tuk and you do not need to negotiate the price. Both offer a pool option in which you share your ride with others that makes it even more affordable. Ola also has a tuk tuk option that is one of the best and most affordable way to travel for shorter distances. I never had to wait long for a Ola or Uber to come and most of the time when I ordered the pool option I had no other passengers. There is of course always the option of stopping a tuk tuk on the road, but be prepared to negotiate about the price. At the bus and train station there is a prepaid booth with fixed prices. The public transport system works pretty well in Mysore and with the help of Google maps I used the bus pretty often. If you check the route you want to take Google maps will tell you which bus number to take. From Bangalore there are frequent trains and buses to Mysore. Buses take around 4 hours. The daily shatabdi express takes only 2 hours while other trains take longer (3-4 hours). Mysore indeed has a lot of charm to it. I loved mysore museum with all gold and grandeur. This is a great guide of important places to be covered. Never heard of Mysore before and you certainly have made me want to visit. The palace is beautiful.